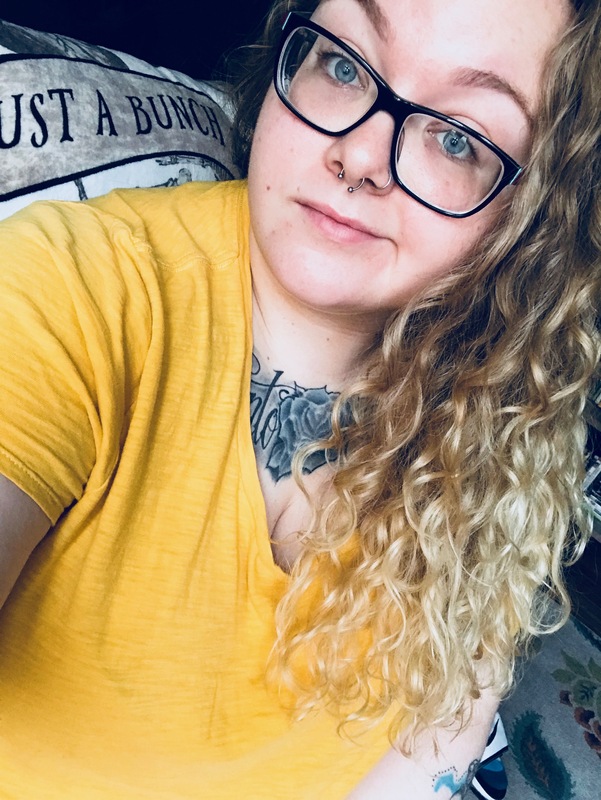 (could) promote feelings of change and hope, and they also called out to people— not in the sense of a call to action, but they communicate a message. Both messages being communicated are simple, made up of very few words, and yet they are powerful messages. While these posters are similar in these ways they diﬀer in very important and even subtle ways. Election Poster This election poster comes from Germany in 1938 and is encouraging the viewer, or audience, to vote “Yes!” for Hitler in the German election on April 10th. It was printed in what we now associate as the Nazi colors; red, black, and white. It depicts a group of ten right hands in what we can identify as the Nazi salute, and granted this was the 1930s but these hands are all white and masculine. 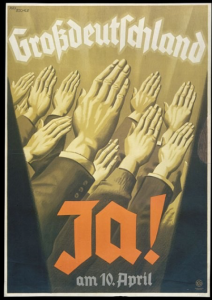 This is an election poster so it has a call to action, that being for the viewer to go vote for a “Greater Germany” by joining the Nazi’s and voting for Hitler. It is attempting to unify people and to get them to believe in Hitlers plans for a “Greater Germany”. 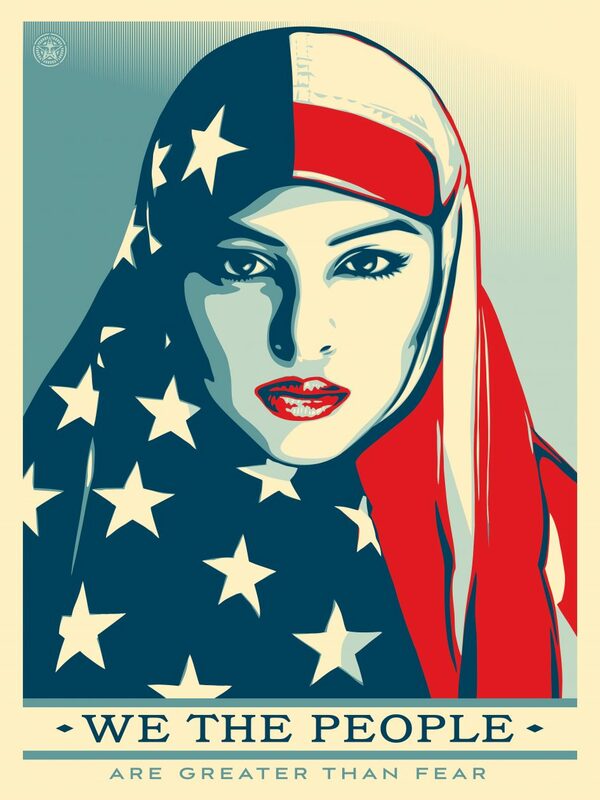 We the People campaign This poster is one of a series created by Shepard Fairey in the wake of the 2016 Trump election. They were initially mass printed in three major American newspapers on January 20th, 2017. 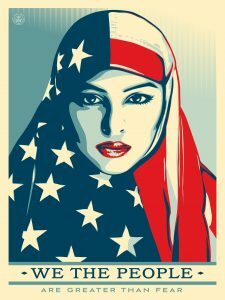 This poster, which depicts a muslim woman in red, white, and blue, like the others in the series were forms of protest. In a still deeply divided America this poster sends a message of hope to those who felt/feel that America is now not as “great” as she could and should be. We see a muslim woman wearing an American ﬂag hijab and she is staring right back at us(the audience). Below her the poster reads “We the people are greater than fear”. In an election that was ran rampant with misinformation and fear this was an uplifting message of solidarity for those who felt/feel betrayed by the election outcome. Propaganda in it’s simplest deﬁnition is a form of communication that distributes biased information. 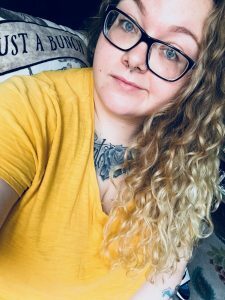 Like everything else propaganda is not innately bad or good, it is the message that it is trying to spread that deﬁnes the propaganda.Today it is imperative that we strive to recognize the truly harmful and negative propaganda.